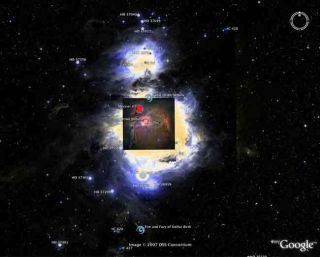 A close-up view of the Orion Nebula, with the Hubble image of the nebula overlaid, in Sky in Google Earth. A new product from Google offers a virtual tour of the cosmos, showing off Hubble Space Telescope images set against starfield backgrounds made from other telescopes' photographs. The download, "Sky in Google Earth," is free with the newest version of Google Earth. The cosmic tour adds to Google's mapping offerings that now include Earth, Mars and the moon. The package includes 125 Hubble images with captions and links to news and background information. Other photos, showing large swaths of the sky and about a million objects total, come from the Digitized Sky Survey and the Sloan Digital Sky Survey. A user can select specific objects, such as the famous Pillars of Creation, or from categories such as colliding galaxies. Constellations can also be perused, and they disappear as the user zooms in on an object. Sky in Google Earth is produced by Google, through a partnership with the Space Telescope Science Institute, which operates Hubble for NASA and the European Space Agency. Other competitors include The Sky (Software Bisque), Celestia (Open Source), SkyTools (Skyhound Software). Microsoft is also creating the Virtual Observatory, expected to be very similar to Google Sky.